We're officially one day away from wrapping up the first month of 2018! We've gotten so many requests to bring back a fun printable and we couldn't think of a better time to share our brand new Weekly Check-In worksheet! It's perfect to use as an accountability partner as you tackle each of the upcoming weeks, and a great companion to all your 2018 goals. This sheet reminds you to check in at the end of each week to reflect back on what happened, and cleans the slate for a new week ahead! Getting caught up with a ton of to-do's and our busy lives can quickly get overwhelming, so the idea of a simple worksheet being able to re-center your focus is pretty powerful. We've been doing this sheet every Sunday as we close up shop for the week - it's a wonderful way to carve out 5-10 minutes to create a little weekly ritual that has anchored our weeks and allowed us to finish out each work week with some "umph". We've even included a habit tracker because we really believe that by making day-to-day things a habit, we end up making it a part of our routine which allows us to remove it from our to-do list! 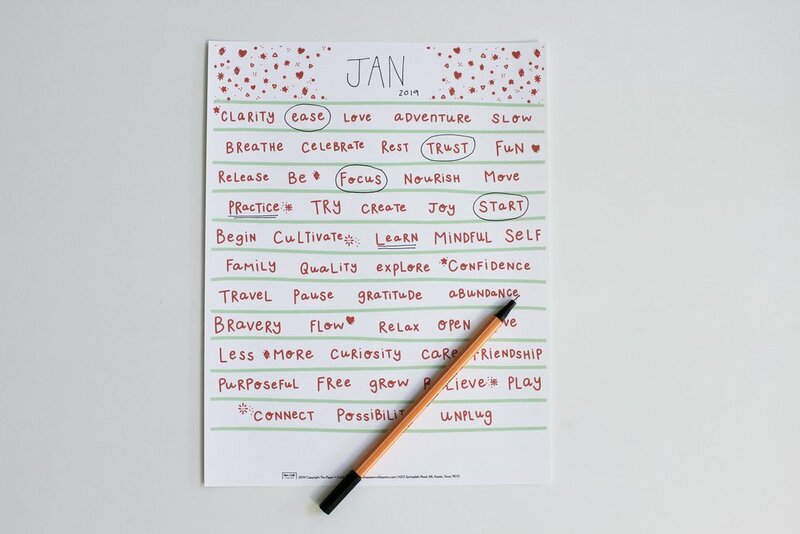 And with each month taking us further away from the fresh feelings of the New Year, we're committed to using these sheets to hold us accountable and carry on this momentum on for the rest of the year! Click on the image of our 2018 Weekly Check-In Worksheet to download it for free! 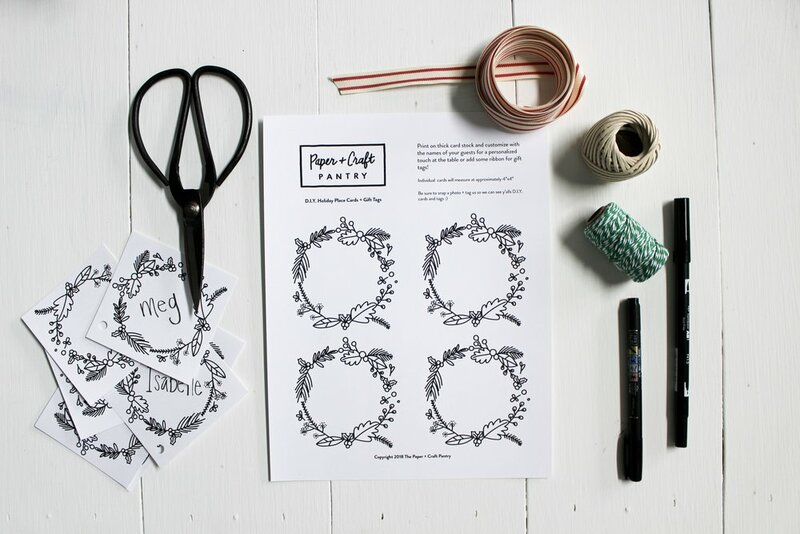 Share your worksheets in action with us by tagging @thepapercraftpantry on Instagram! With everything going on in the world today, it's easy to feel bogged down with the constant cycle of negativity on the news. For the most part, we probably all grew up with our moms telling us the importance of being kind to others, but it seems like we're at a turning point where everyone could benefit from a little extra dose of positivity. Since we like to think it's the little things in life that make the world go round, we designed these mini note cards as a way for you encourage your neighbors, remind your friends how much you love them, and generally just spread some much needed "nice-ness" and joy in the community! All you have to do is request these free downloadable Nice Notes, below, and print out as many copies as you'd like! Add one to your bathroom mirror (better yet, leave one in your office bathroom so everyone can enjoy). Leave it on someone's windshield to find when you're out and about. Present it to a stranger who seems to be having a rough day. Slip it to a friend you haven't seen in a while. Pop one in your neighbors mailbox, or leave one for your mailman! Print out a sheet and gift it to a friend, encouraging them to pass out nice notes in their community. Don't forget, a little goes a long way. And you never know how a little encouragement in the form of a note can impact the person receiving it! Fill this out to get these printable mini note cards sent right to your inbox! Don't forget to check for a confirmation email in your inbox. Once you have verified your email address, our Printable Nice Notes will be on their way to you! When we think of spring, we dream of bright pastels, motivational messages and updating our home decor! So, we partnered up with one of our amazing instructors, Allie Biddle, to bring you this simple but sweet D.I.Y. wall art that is just as easy as paint-by-numbers, and will look great in any room! Allie is a designer and artist out of Denton, Texas who crafts one-of-a-kind hand embroidered hoop art and stitched mixed-media designs. If you're interested in learning more about embroidery, Allie will be teaching a Intro to Hand Embroidery workshop as well as a Hand Embroidery: Floral Bouquet workshop this Saturday in the studio! The beauty of this design is that you can pair it with any color(s) that compliment your current decor — from primary colors to neutrals like cream and sand. Keeping with the springtime theme, we chose a few bright pastels and even mixed up the design by alternating stitches to create a fun color-blocked design (like the one above). Scroll down to request a copy of your FREE printable design, and get to stitching! First, you will notice that there are several dots arranged around the main design. These will act as your guide for stitching the completed piece. To prevent tearing, you will want to pre-punch each hole with the needle before threading the embroidery floss through the paper. Next, you will want to choose a color pattern for your piece. This would look great with one bold color, or several complimentary colors. You can stick with the pre-punched holes, or even add in your own to create a customized version (like the one below). *PRO TIP: Allie recommends using DMC threads for brighter, more saturated colors! Once you have decided on a plan, you can begin stitching your design. After you're finished, pop your artwork in any 8X10 frame by trimming down your design, or hang it as-is from your bulletin board with a DIY marbled thumb tack. Don't forget to tag us on Instagram @thepapercraftpantry with a photo of your finished work. We'd love to see how yours turned out! Download the Stitched Wall Art Printable! Don't forget to check for a confirmation email in your inbox. Once you have verified your email address, our D.I.Y. Stitched Wall Art Printable will be on its way to you. Learn how to hand stitch sweet bouquets of poppies, echinacea, and daisies during this hand embroidery class!